Featuring Joseph Beuys (DE), Melanie Bonajo (NL), James Bridle (UK), Felix Burger (DE), Centre for Political Beauty (DE), Johan Grimonprez (BE), Susan Hiller (USA), Samson Kambalu (MW), William Kentridge (SA), Laura Kurgan (USA), Cristina Lucas (ESP), Metahaven (NL), Pedro Reyes (MX), Stanza (UK), Timo Arnall (NO), and many others. 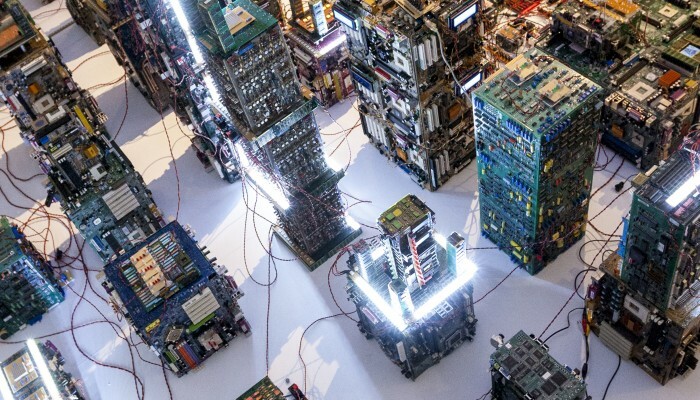 The Nemesis Machine is a miniature city, made up of wires, chips, computer parts, switches and specially designed electronics. The installation shows the current data flow of Smart City London, complete with environmental sensors and surveillance cameras, as well as data from traffic information and environmental monitoring systems. 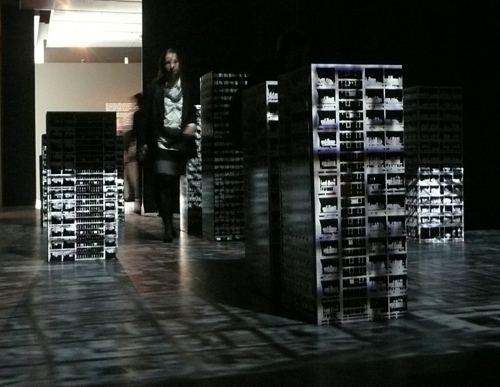 The work responds to the temperature, light, pressure and sound of the simulated city. If something changes in London, it’s registered directly in motion, sound and light in the miniature city of Utrecht. The Nemesis Machine is like the avatar of London and is not only driven by the real city, it is entirely dependent on it. The Nemesis Machine is een miniatuurstad, opgebouwd uit kabels, chips, computeronderdelen, schakelaars en speciaal ontworpen elektronica. De installatie toont de actuele dataflow van Smart City Londen, gemeten met omgevingssensoren, bewakingscamera´s, verkeersinformatie- en milieumonitoringsystemen. Het werk reageert op o.a. temperatuur, licht, luchtdruk en geluid van de nagebootste stad. Als iets wijzigt in Londen, zie je dat direct terug in beweging, geluid en licht in de miniatuurstad in Utrecht. Nemesis Machine is als het ware de avatar van Londen en wordt niet alleen real time bestuurd door de echte stad, maar is er volledig van afhankelijk. Soundcities – Herd Above The Noise. 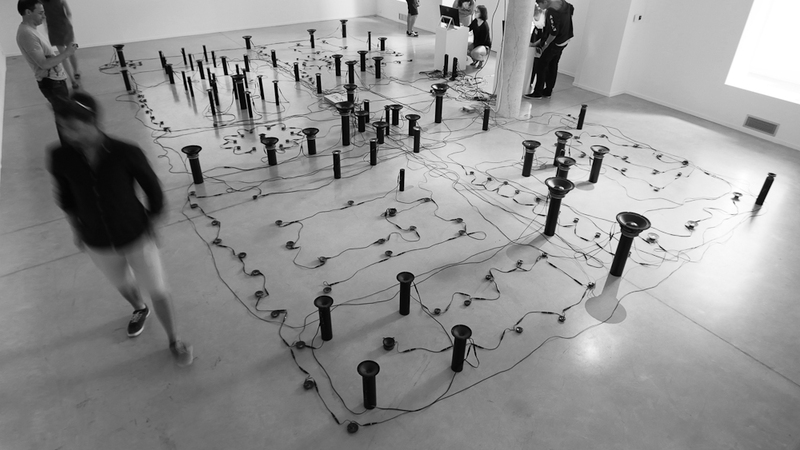 Installation of city sounds on 170 speakers. Soundcities was the first online open source database of city sounds and soundmaps from around the world, using found sounds and field recording. The concept started in 1995 with various interactions. 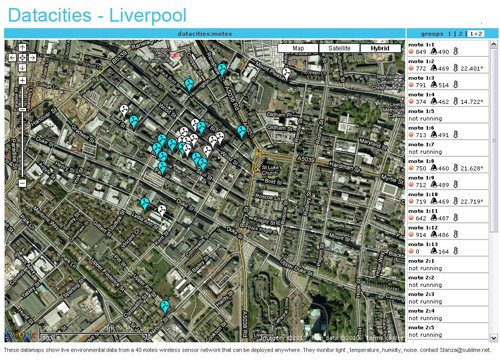 Stanza’s soundmaps have been online since 2000 and the Soundcities database since 2004. 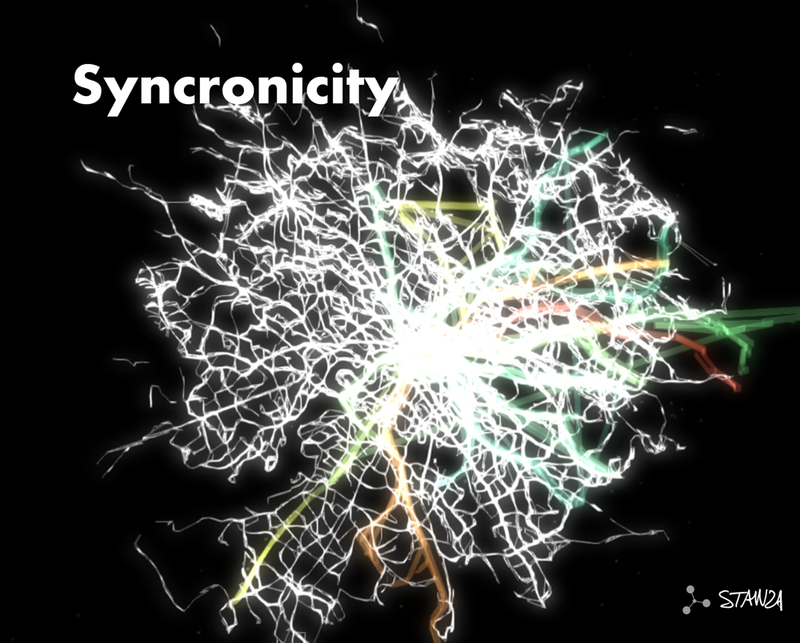 Le projet d’installation Soundcities s’inscrit dans le prolongement de la base de données interactive éponyme initiée par Stanza en 1995, pour apparaître sur le web en 2004 dans sa version actuelle, renouvelée en permanence. http://www.soundcities.com/ est la première base de données en open source rassemblant les sons des villes grâce à des captations sur le terrain, à des compilations de sources existantes, et ouverte aux contributions en ligne. In the run-up to the 2015 Bruges Triennale (20 May to 18 October), the Arentshuis . The work of this internationally esteemed artist has been shown in about fifty exhibitions since 1984, from Tate Britain, the ICA and Victoria & Albert Museum in London and the Plymouth Arts Centre to Mundo Urbano in Madrid, the Venice Biennale, the Sydney Biennale, the Sao Paulo Biennale, the Museo Tamayo Arte Contemporáneo in Mexico and the State Art Museum in Novosibirsk. At the heart of Stanza’s work lies his interest in the urban environment, the networks of cameras and sensors to be found there, and the associated issue of privacy and alienation. He is particularly interested in the patterns we leave all over the place. In how we consciously or unconsciously influence each other, and also the degree to which technology may in future take over control of our own bodies and our presence in the city. Stanza studied at Goldsmiths College, Greenwich University and Central Saint Martins College of Art in London. At the Arentshuis he will be showing an installation, a series of paintings and a sculpture. 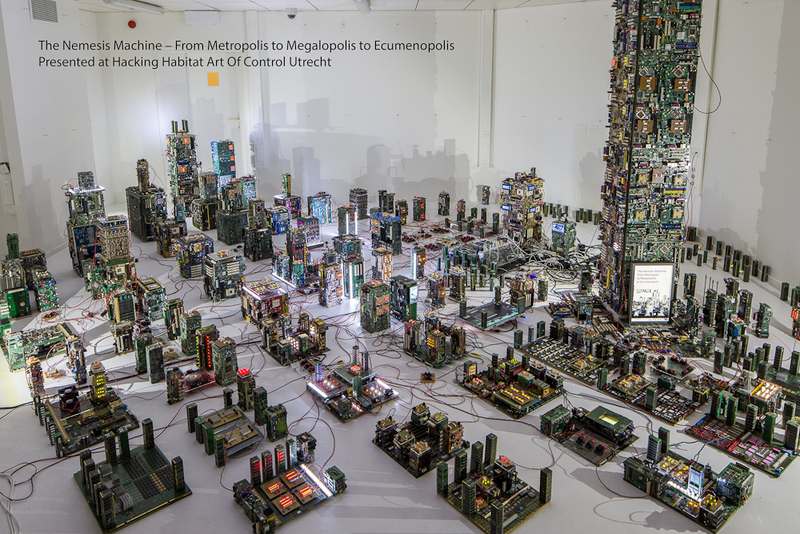 The Nemesis Machine is a large installation (adapted to each place where it is displayed) that is a miniature city. 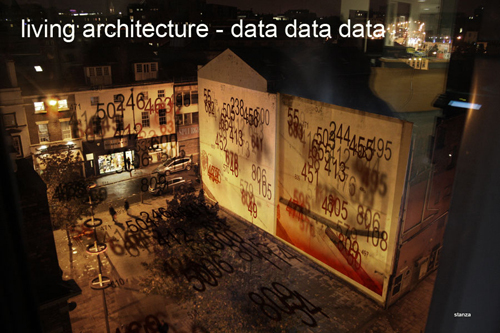 It visualises life in the metropolis on the basis of data transmitted from London. So the city constructed in Bruges using electronic components reflects in real time what is happening on the other side of the Channel. Small cameras show pictures of the visitors so that they become part of the city. Stanza’s paintings show the complexity of the city. When they are scaled down, roads and rivers are reduced to an inextricable tangle of lines, curves and scratches. In this way, the grids and patterns make every city into something universal. Cities look like each other, cities grow towards each other, cities become one: the metropolis becomes a megalopolis and then an ecumenopolis. Cities look like colonies of insects with gigantic towers that look down ominously on wasteland and empty spaces. In his paintings, Stanza combines existing and imaginary cities to form a new ensemble of structures. The artwork “The Agency At The End Of Civilisation” is a real time interpretation of the data of the Internet of Cars project using the UK car number plate recognition system aligned with real time images from one hundred CCTV cameras in the region of South of England. The installation presents all this as a spatialised audio experience of spoken texts and generative visuals. The audience engages with the work as observer (of the surveillance and recorded space) looking at 24 screens, a dozen speakers, and a labyrinth of CCTV cameras built as an art installation presented on a plinth. http://stanza.co.uk/agency/index. The Emergent City. 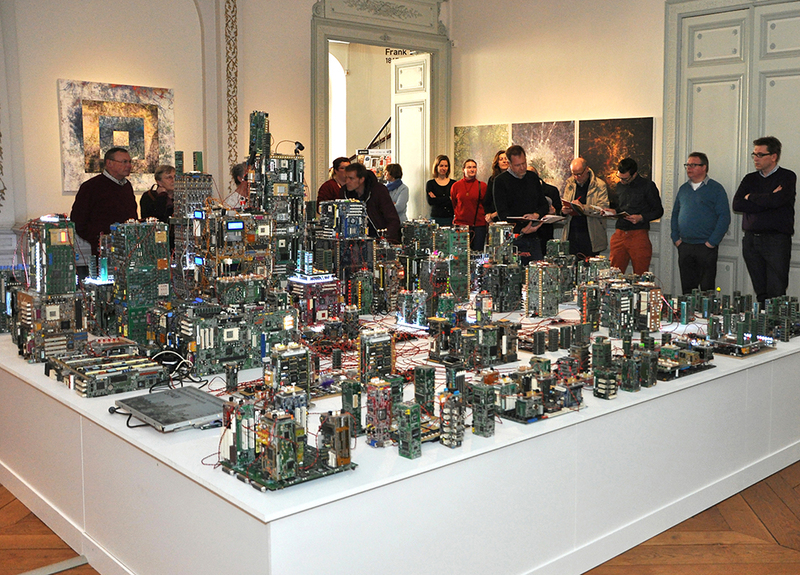 A Life From Complexity to The City of Bits. ‘Data as Culture’ is reflective of our time. 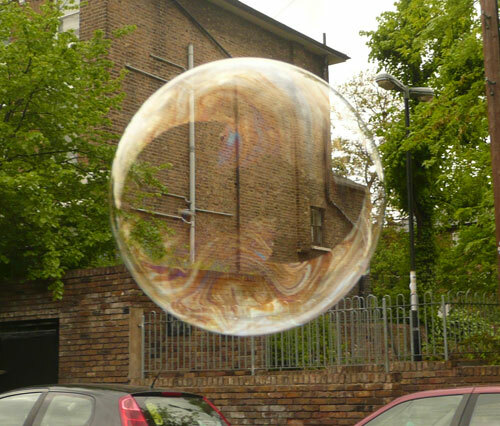 Body is a sculpture which responds to the emergent properties of the environment in South London where the artist’s network is situated for the duration. It represents the changing life and complexity of urban space as a dynamic, kinetic artwork. 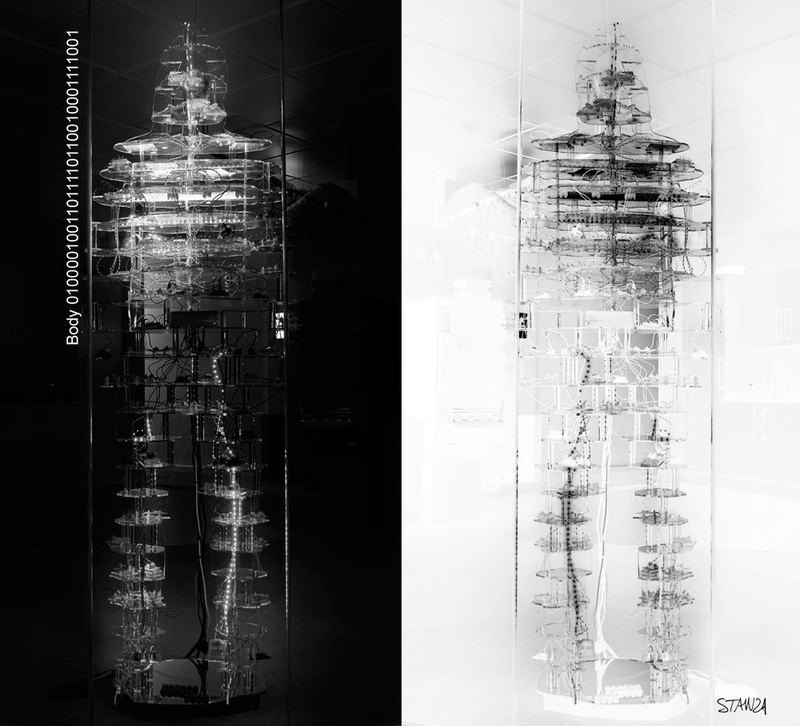 Real-time environmental data is embodied in Stanza’s life-size sculpture assembled from computer components and acrylic slices of his own physique. In ‘Body 01000010011011110110010001111001′ the urban environment provides a dynamic flickering and clicking sentience to the otherwise inert structure, reflecting the personal level of influence data has on an individual. 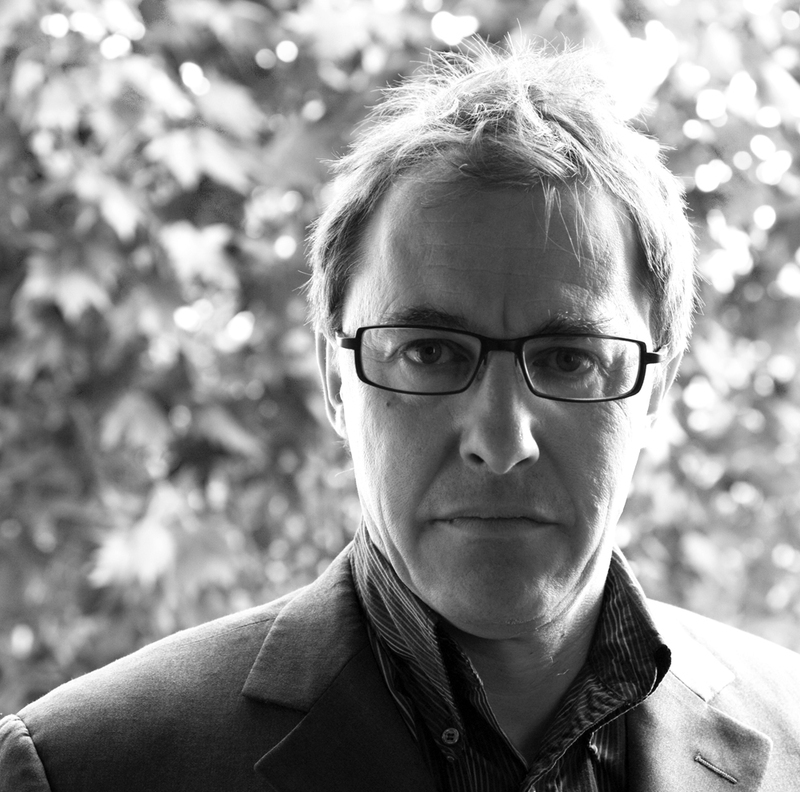 The British artist Stanza is keynote and chair at the Fascinate Conference Pervasive Media. The British artist Stanza is keynote and chair at the Fascinate Conference Pervasive Media. 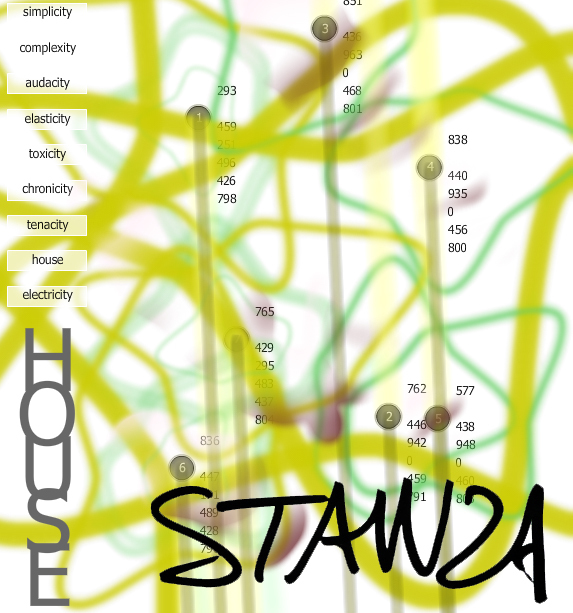 Stanza will be talking about networked connected space, big data, his work. FASCINATE is an interdisciplinary conference investigating the current and future applications of ubiquitous computing technologies in visual and performance arts, architecture, craft, design and interactive media. FASCINATE will explore technology, design and experience related to ubiquitous computing. Areas of interest include: ambient intelligence; experience design; cognitive environments; augmented performance; pervasive media and the internet of things. FASCINATE will offer participants the opportunity to present and discuss their work, inspire and be inspired by the work of others across a range of fields of practice; build on the experience of keynote speakers and establish new and eclectic collaborations. Comments Off on The British artist Stanza is keynote and chair at the Fascinate Conference Pervasive Media. Stanza Metal Cities at Flux Jewellery School. 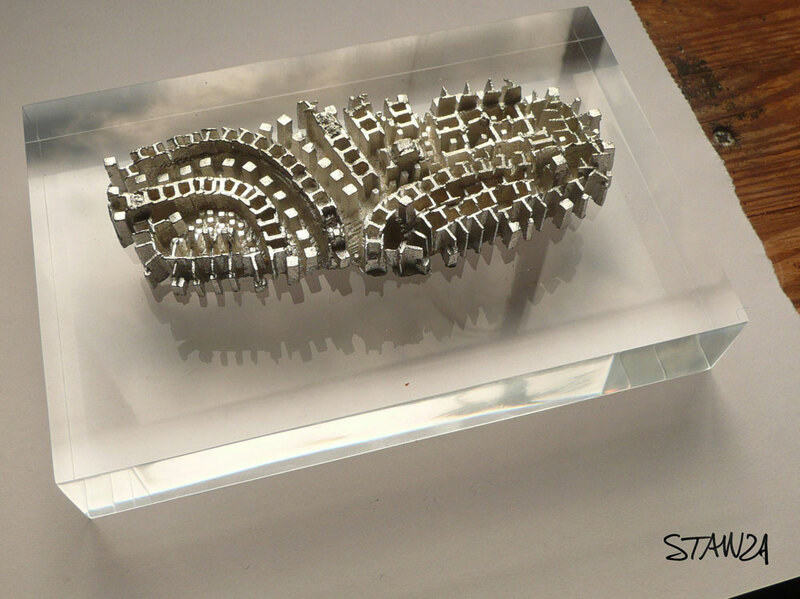 Stanza has been hand making over one hundred hand crafted metal cities at Flux Jewellery School. I have been attending this jewellery course where I am learning some skills of the old analogue metal trade at Flux Studios Jewellery School. Its a great space with loads of courses. I attended the intermediate course and they let me get on with my own work. So far I have made one hundred individual hand made cities called The City Of Dreams . There is no digital process involved, each city is based on simple codes and rules. They are approx 12cm across. These analogue cities are deliberately made to appear like they are made by some computational digital process. 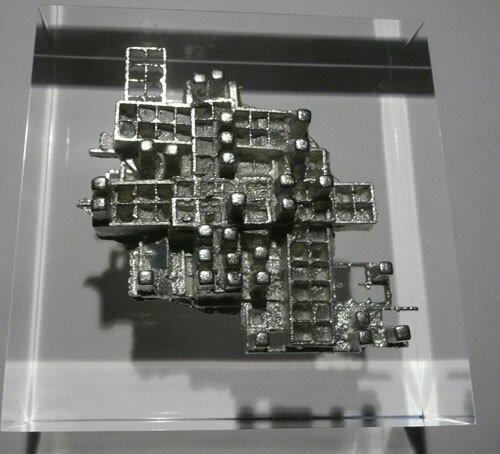 Each is like a 3d drawing, the metal used is pewter. Comments Off on Stanza Metal Cities at Flux Jewellery School. 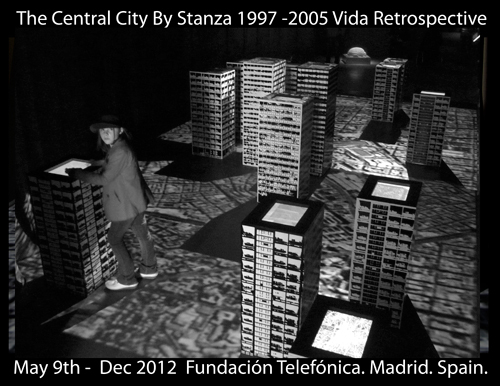 British artist Stanza wins SHARE PRIZE 2012 in Torino for Capacities. A piece of work using real time data of the city. The British artist Stanza wins SHARE PRIZE 2012 in Torino for Capacities. A piece of work using real time data of the city. This artwork captures the changes over time in the environment (city) and represents the changing life and complexity of space as an emergent artwork. Its an artwork about the internet of things, smart cities and connecting spaces. What is the role of art today, in this moment of social transition towards the city of the future? It was from this perspective that the artists interpreted the theme Open Your City, exploring the key concepts word by word. The short-list of the Jury reflects the reappearing artistic interpretation of the modern urban landscape as system, where the solid element is replaced by the message, the information and the database, a real, but dematerialized city. Artists have been short-listed by an international jury, consisting of Simona Lodi, Carlo Ratti, Bruce Sterling and Mirjam Struppek, on the basis of the artistic value of their work and its relevance to the Share Prize theme. 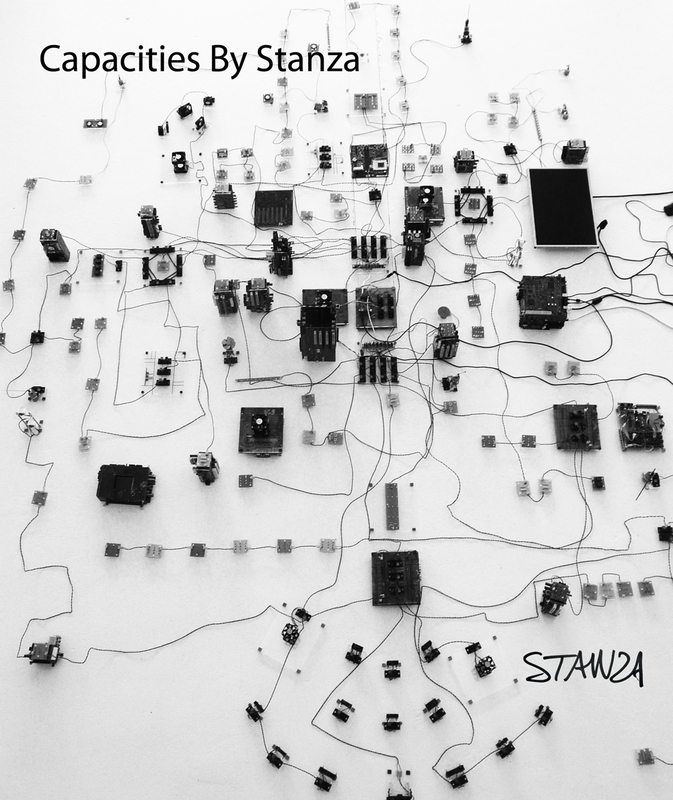 Capacities: Real Time Complex – Connected Cities by British artist Stanza is an installation dedicated to the complexity of life in an environment. Changes in each of the spaces are monitored in real time, as they give rise to constant tensions, highlighting the behaviour of complex systems and the emergent properties that appear. In this case the organism is the city and not the single individual; it is the entire urban habitat as a whole, revealing its nature as a multifaceted system. The installation is the real-time mirror image of everything that changes, gathering huge amounts of data that are transformed aesthetically into a physical copy of the city, made up of cables, lights and sensors that represent shifts in environmental parameters measured numerically. The obsessive focus is on the observation of environmental data by gathering measurement on temperature, light, atmospheric pressure, noise and the sounds of the city outside the museum. Gathering digital data on the environment has become an art, and art has become a data set rather than a collection of molecules. The short-list of the Jury reflects the reappearing artistic interpretation of the modern urban landscape as system, where the solid element is replaced by the message, theinformation and the database, a real, but dematerialized city. Le parole OPEN YOUR CITY sono la traccia tematica che ha guidato la mostra di Share Prize. Il premio ha come obiettivo scoprire, promuovere e sostenere le arti in epoca digitale. La selezione delle opere finaliste della mostra è dedicata agli artisti che interpretano l’innovazione come linguaggio di espressione artistica, in ogni modo e forma. Una giuria internazionale composta da Simona Lodi, Carlo Ratti, Bruce Sterling e Mirjam Struppek hanno scelto gli artisti in base all’aderenza al tema e al valore estetico dell’opera. Quale è il ruolo dell’arte, in questo momento di transizione sociale verso la città del futuro? In quest’ottica gli artisti hanno interpretato il tema Open Your City, sviscerando le parole chiave. La short-list della giuria riflette l’interpretazione del riapparire artistico del paesaggio urbano moderno come sistema, dove l’elemento solido è sostituito dal messaggio, dalle informazioni e dai database, una città reale ma smaterializzata. Capacities: Real Time Complex – Connected Cities dell’artista inglese Stanza dedica la sua installazione alla complessità della vita in determinato ambiente. Ogni ambiente è sottoposto a cambiamenti continui che sono monitorati in tempo reale. I cambiamenti portano continua tensione e stressano il concetto di linearità ed evidenziano le emergenze che compaiono. In questo caso l’organismo è la città e non il singolo cittadino ma l’intero complesso urbano, tracciandone il profilo come sistema multiforme. L’installazione è lo specchio in real-time di ciò che si modifica, raccogliendo grosse quantità di dati trasformati esteticamente in una copia della città ma fatta di cavi, luci e sensori che esprimono il passaggio degli elementi ambientali raccolti in forma numerica. L’attenzione insistente è osservare i dati ambientali raccogliendo la temperatura, la luce, la pressione atmosferica, il rumore, e il suono della città fuori dal museo. Raccogliere elementi numerici che riguardano l’ambiente è diventata un’arte e l’arte e’ diventata un insieme di dati piuttosto che un insieme di molecole. Comments Off on British artist Stanza wins SHARE PRIZE 2012 in Torino for Capacities. A piece of work using real time data of the city. The Art of Environmental Data. An interview with Stanza via email for Jack Stewart studying at the Manchester School of Architecture operating under the umbrella of the Remap Unit, which focus upon mapping and data collection to expose the latent and invisible qualities of the city. Stanza places sensors On Google maps 2006. 1. The Sensity Projects aim to record data in the emerging city environment; how do you feel the use of such data could be useful for architects and designers in informing their designs? Sensity and its sister projects have gone along way to not only illuminating possible uses but and to demonstrate multiple scenarios. Anyway to be specific, other scenarios that could be questioned from the data sets include, noise monitoring across spatial environments and how this is affected by a real time input. More specifically focused sensors could give data that can lead to conclusions about what types of material are best suited for a site, or even a “consciousness” of the space, as well as all the bio chemical possibilities. Most of these types of systems themselves can also be “building management systems”. 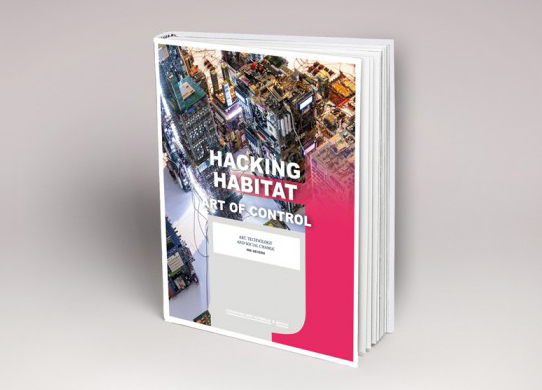 The data can not only be adapted for security and monitoring the social welfare of the space can be nurtured; it could feed back into a system designed to self regulate depending on the variables and properties imposed. 2. How do you feel that Sensity and Soundcities re-innovate and enrich the urban systems we currently operate in? This has to be taken as two questions because of the underlying structure and objectives of these two separate projects. Sensity for sure allows us to see or at least make more tangible the invisible in the world around us. Sensity supports this premise by producing new information that is changing real time. This information is being also affected by out default interactions with the space and the environment. The Sensity project allows us to speculate on the city itself as a living breathing space with its own DNA that evolves and mutates. This metaphorical approach allows a freedom to speculate that the spaces we design are in fact emergent entities and that various properties and variables can be monitored; ie the stresses of the space and “emotional” conditions are what make a space enjoyable habitable or even dangerous. Sensity can up pick on this. Soundcities, because it works in a different way addresses issues that I describe as being more of the modernist age. However as noise and sound involve field recording (we are also presenting the art of environmental monitoring). However now we are taking about the sound we literally hear as we walk out of the door. Not just as noise (data) or as noise pollution but also as an appreciation of sound and how this not only affects the space but is the space. The noise is the city, the noise is the music, the city is the orchestra and we are just conductors whose interactive actions compose this music as we walk around. What Soundcities does is create an open source archive, a resource where better speculative questions could be addressed. The unique XML feed system also allows other to make user interactions both software and hardware that can control the sounds or to make spatialisation and sonfications of the environment based on the analogue recorded sounds. Image (c) Stanza Datacity art. Data from across the city. 3. Why do you feel the recording of emergent or changing data of the city is important? It was my research as an artist that has led me here from fixed object and linear works about the city and urban design (i.e. paintings drawing) I then made interactive systems and closed generative systems. I concluded that the next model was to adopt and create a real time system. My feeling for this is primarily based on my inquiry into how to work with “time” itself. These works are not archived. In Sensity the data is not recording; the works, the experience, ever exists in the present. It’s that moment that I am interested in making more of. I want to somehow get inside the idea of present time. This present tense we all share with one another in a very equal way does not discriminate. The present second as it shifts to the next is the moment that I want to understand. So the question is slightly skewed as there is no “recording” in the Sensity process (I have yet to build in an archival set of data results as I haven’t been funded to take this further and this would be most useful i.e. to study a space over a longer time. This is why the research is needed. To answer the why question? 4. Soundcities takes similar concepts from your previous work, but provides a platform for anybody with access to the net to add to. Do you feel this has richer content and why? The soundcities content is different. Instead of being data sets and numbers that relate to the environment in real time the soundcities takes snapshots of the environment as sound that is recorded then placed online. The interesting thing now is the project is opened up for others allowing a re mixing or mash up. It allows these “others” to do with the “material” other things for example concerts and art installations. Using the XML feed other applications are created ie phone apps merged with you PS position or visualisation of noise across a space…all sorts of things are possible. 5. If architects were to inform their designs through data from Soundcities do you think there would be a social exclusion issue for those without access to the internet and why? I think the sensors in Sensity project would be better for this sort of thing. However the issue becomes about the network, borders of control, and issues to do with sharing and protection. In my view it will get really interesting when dozens of spaces and buildings all link up in virtual space. To create what I term ”The Third Space”. (This was a funding proposal rejected by the AHRC and The tech Strategy Board. I suggest there are over lapping areas of the city which can only be found online ie merged cities online Madrid, London Paris can overlap. I will go intio more details. below. I have many ideas for this but no money as I am not funded. However is a summary of The Third Space. The project seeks via practise based research to create novel artistic interfaces using environmental data. Outputs from the research include sonifications, visualizations, and sculptural objects. This work focused on data as a medium for artistic creativity and how meaningful and well as poetic experiences of space / environments may result from quantitative analysis of the results. The aim is to speculate on new ways of comparing, conceptualizing and then visualizing environmental data and real space. I proposed in a recent interview for The Internet of Things Council (http://tinyurl.com/3trotzq) that future cities will be merged into real time connected up data cities. Not just one space, but a connection of networks and of real time information flows. I am now interested in developing deeper research over three years to question how this shared dataspace can overlap, creating a new space in between, which multiple nodes can share. 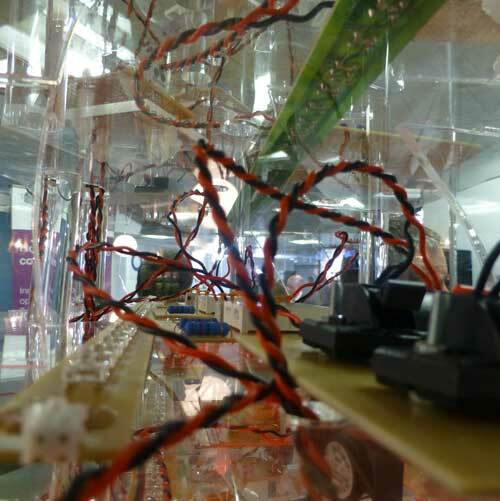 The methodology involves collecting data from sensor networks, disseminating the computer techniques developed, and making artistic prototypes. The aim here is to give tangible form to this new space, the space where the cities overlap, presenting an alternative urban virtual environment and creating new artworks and installations. Within “The Third Space”, the initial focus is on the data sets of noise, pollution, light, and temperature. In other words the sensors will initially monitor urban environments. To achieve this I will connect up multiple spaces (cities / environments) using motes sensors and this will be published online via XML feeds. These new online spaces will in turn lead to newly created online bespoke interfaces. I then aim to demonstrate that there is a new and unique online avatar where the data overlaps creating the Third Space. I will speculate how the flow of the data can be set to affect the behaviour of the output environment. 7. What would you say are the challenges we face in further developing and integrating data collection like Sensity into the urban realm? – How can this information be meaningfully represented to new audiences? – How can this data be displayed (visualisation and sonifications) in new and original ways and do the results create new ways of understanding the environment? – What are wider social implications of opening up real time networks; who owns this space and what are the ethical implications of real time information systems for artworks? Underpinning this work, are a whole series of potential problems about observation, surveillance, and the ethics of the control space. I research current surveillance systems and wireless sensor networks to come to an understanding about the social and ethical implications of such technologies both in artworks as well as public domain space. By building my own art systems and tools, (which support my research questions); I also aim to raise further questions about the ethics of the control space and surveillance culture. 8. How do you feel that artworks such as your own could shape a ‘future city’? Future cities will be merged into real time connected up data cities. I believe there is a new social space that exists in between independent virtual data networks, a new avatar space. The Third Space and the work I have done before have becomes a series of artistic prototypes that offer new insights into networked spaces. 9. All of your projects are open source; what is your reasoning for this decision? I don’t like the term open source or but my work endeavours to collapse the borders created by networks so there is a free flow and exchange through the system both for input and outputs of ideas and latterly resources which I call assets (the data and the information. 10. How do you feel projects such as your own pave the way for empowering and liberating the city dweller? The aim in my work is to develop a more socially engaged practise, to embed a deeper context based on critical reflection regarding notions of privacy, surveillance space, control space and meaning of newly created real time spaces. 11. Your data visualizations are stunning; what do you feel the importance is for translating the data your gather into something people can visualize and understand? The objectives is both to create new artistic experiences questioning the notion of realtime environments while using of data as a medium and delivering creative outputs. And also create work that reflects upon issues of privacy, and surveillance space. I think I would get sidetracked here but maybe I could just say the objective is to create a new way of seeing and the experiencing the space/ environment. work ls around us. By doing it this was not only do we see how we affect the systems but and most important the use ie users (us the people) are by default embedded in the interactive and responsive process. In other words we become part of the work. I am interested in making systems where by default the users are the work, the artwork. Its a feedback loop, every actions we have has a reaction, every reaction causes change, this change happens over time and its reflected back in front of us either as the changing world we experience and now as art. 12. How do you feel your projects impact the ownership of the spaces they are deployed in? This question needs an essay in its own right and goes off in another direction that’s interested me for some time. I made called Public Domain where I tackled this question head on. Public Domain uses live CCTV across the city to extend space and invoke impressions of transparency with architectural space. . Public Domain is an experimental approach to ownership in information in networks. Instead of the linear tree like system with the one central viewer, all the cameras and views (resulting data) are given away and all the views can be seen online by all. The data is mixed into an online collage, using specially created software viewable by all. Another work “Visitors to a Gallery- referential self, embedded” uses the live CCTV system inside an art gallery to create a responsive mediated architecture. This artwork is responsive to the body in the data space. The visitors act as an intervention in the gallery space and become embedded in the artwork. The idea of using the information inside the space is also to make the space transparent and extend the gallery space outwards. The gallery space is also extended virtually onto the internet as the feeds from the installations images are broadcast live. 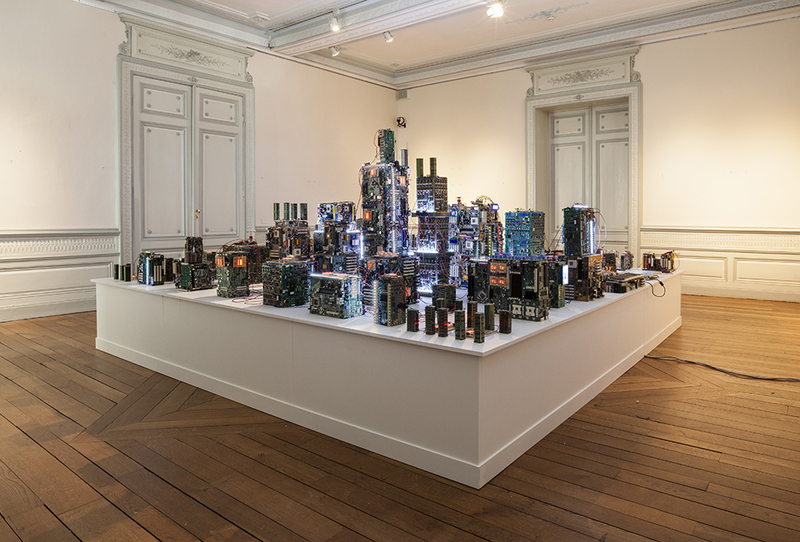 The visitors to the gallery thus become embedded in the artwork and this permeates the larger system of data and information over the internet. The installation called The Central City has 15 touch screens built in towers blocks which are all interactive. On the floor is a generative map of the city of Madrid. El concurso de Arte y Vida Artificial VIDA fue creado por Fundación Telefónica en 1999 para promover la creación artística basada en las nuevas tecnologías y se ha convertido en uno de los premios artísticos de mayor prestigio en el encuentro entre el arte, la ciencia y la tecnología. A lo largo de sus trece ediciones VIDA ha premiado obras artísticas desarrolladas con tecnologías de vida artificial y sus disciplinas asociadas como la robótica, la inteligencia artificial, los algoritmos caóticos, los virus informáticos, la biotecnología, los entornos virtuales o la escultura sonora y se han presentado 1.478 proyectos procedentes de más de 50 países. La presente propuesta expositiva, comisariada por KarIn Ohlenschläger, deja patente la evolución del concepto de vida artificial en relación al arte y la existencia de distintos modos de indagar y afrontar el diálogo entre arte y nuevas tecnologías.Algunas de las 23 obras expuestas simulan la evolución y los comportamientos de los sistemas vivos en soportes digitales y animan materiales inertes. En otras, se acometen de manera decidida la manipulación y transformación de la materia viva. Con ello los artistas nos hacen partícipes de la reflexión sobre qué es la vida. La exposición también permite explorar la convivencia entre distintas especies naturales y artificiales, entre lo físico y lo virtual, entre lo orgánico y lo tecnológico. Estas experiencias aproximan la vida artificial a nuestro entorno cotidiano. Se muestran obras que afrontan los valores éticos y simbólicos del avance de diversas ramas de las ciencias y crean conexiones entre el arte, la ciencia y la conciencia social, política, económica y cultural. El recorrido por la exposición se articula en cinco secciones que nos llevan desde la escala nanométrica del ADN hasta la dimensión planetaria de la vida : El código de la vida ); Robótica: orden e insumisión;, Sistemas simbióticos; la vida es comunicación y Membranas sensibles.Here are some images from the recent exhibition in Madrid for Vida. 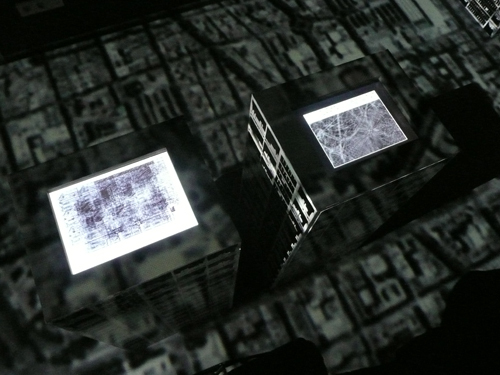 The installation called The Central City has 15 touch screens built in towers blocks which are all interactive. On the floor is a generative map of the city of Madrid. RvK: Stanza, you were among the first internet artists. What would you say is the most important philosophical step (if we can think in terms of ‘progress’, or ‘going somewhere’) that you have taken in this period? “In the last twenty years there has been a significant shift in audio visual artists’ practise from linear expressions, to interactive (user controlled) mediations, to generative (evolving) and then network-based (real time) systems. Online, this space also expands the whole notion of the artist’s studio. My focus is on the things that change, the flow, the data that describes our experience of the city as space. Data from all sides in systems that can be mediated by all, with varying visualizations communicated over the internet and represented onto different display systems. There are many theoretical aspects to my work, but primarily I am a practice-based artist……in other words I make stuff. RvK: How do feel about the current actualizations of the ‘in between’ space that you felt, saw or heard coming some time ago? “I believe there is a new social space that exists in between these independent networks. Future cities will be merged into real time connected up data cities. A connection of networks of real time information flows. The results created will lead mashed up cities and real time performative city experiences. This conclusion although led from my earlier trails using wireless sensors in a project called Sensity. I am interested in how this shared data space can overlap creating a new space in between which only two nodes or spaces share. For example in one of my artistic experiments I have merged collected data from various real time cities to visualise this new space, the space where the cities overlap and which allude to a new architectural and urban virtual space. Uses of such information might allow rich new interpretative visualisations about the way our world is built, used, and designed. The resulting artworks represent the real time conditions of the city. Works like “Sensity”, create real time interpretations of social spaces that inform the world (online), and hopefully create new meaningful experiences allowing critical reflection on the real time city and the social political undercurrent embedded in the search for the real time city. Underpinning these artworks and research, are a whole series of potential problems about observation, surveillance, and the ethics of the control space. Imagine walking out the door, and knowing every single action, movement, sound, micro movement, pulse, and thread of information is being tracked, monitored, stored, analyzed, interpreted and logged. The world we will live in seems to be a much bigger brother than the Orwellian vision, it’s the mother of big brother. RvK: The data is the medium, you state. Can you explain this a little bit? RVK: Can you find connections to the FB generation? Do you want to? RvK: The key (or one of the keys) is the granularity of input for these ‘smart’ systems. How do you see this? RvK: Your work is filled with wonder? Do you feel that this wonder is facilitated somehow in what is now termed Internet of Things? Sonicity Installation is exhbited in Germnay for Stuttgarter Filmwinter Sound Installation, Great Britain 2011. 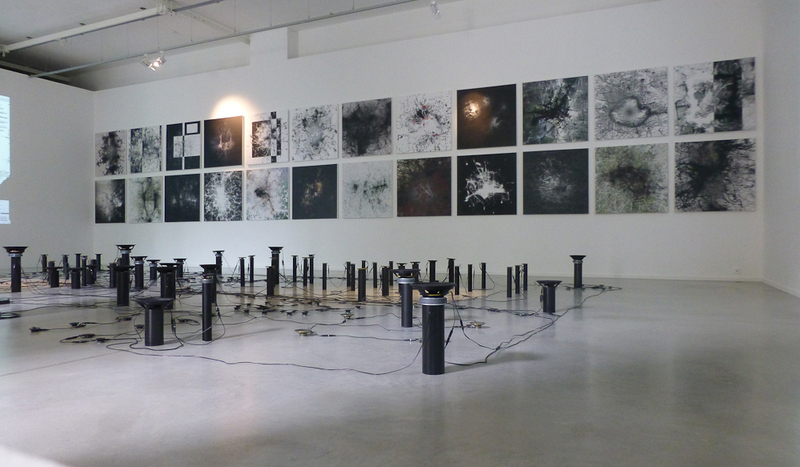 “Sonicity” is a responsive installation, a sonification of the real space and environment. This artwork focuses on the real time space and the experience of the gallery visitor as they interact with the space, using data gathered from these new technologies. My system monitors the space (the building) and the environment (the city) and captures live real time data (light, temperature, noise, humidity, position) to create an ambient sonification, an acoustic responsive environment, literally the sound of the micro incidents of change that occur over time. This artwork explores new ways of thinking about interaction within public space and how this affects the socialization of space. The project uses environmental monitoring technologies and security based technologies, to question audience experiences of the event and space and gather data inside the space. The project also focuses on the micro-incidents of change, the vibrations and sounds of the gallery using wireless sensor based technologies. The sounds you hear are the sounds of the changing environment, i.e. the changes of noise, light, temperature of the space is turned into a real time sound stream using dozens of wireless sensors presented as an installation on 170 speakers. “Sonicity” ist eine reaktionsfähige Installation, ein Hörbarmachen von realem Raum und realem Umfeld. Die Klänge, die man hört, sind die einer sich verändernden Umwelt, das heißt Veränderungen von Geräuschen, Licht und Temperatur werden mithilfe dutzender kabelloser Sensoren in einen Echtzeit-Soundstream umgewandelt und als Installation aus 170 Lautsprechern präsentiert. Die Arbeit konzentriert sich auf den Echtzeit-Raum und die Erlebnisse der Besucher wenn sie mit dem Raum interagieren. Dabei werden Daten, die durch diese neuen Technologien gesammelt wurden, verwendet. Mein System überwacht den Raum (das Gebäude) und die Umwelt (die Stadt) und erfasst live die Echtzeit-Daten (Licht, Temperatur, Geräusche, Luftfeuchtigkeit, Position) um die Umgebung in Form von Tönen abzubilden, eine auf Akustik reagierende Umgebung, buchstäblich der Sound der Mikro-Veränderungen, die sich im Lauf der Zeit ereignen. Das Kunstwerk untersucht neue Denkansätze über Interaktion im öffentlichen Raum und wie sich diese auf die Sozialisation des Raums auswirkt. Das Projekt nutzt Umweltüberwachungstechnologie und Sicherheitstechnik, um die Besuchererlebnisse im Raum zu hinterfragen, wobei Daten im Raum gesammelt werden. Das Projekt beleuchtet auch die Mikro-Veränderungen, die Vibrationen und Geräusche der Ausstellungsräume mit drahtloser, sensorenbasierter Technik. Artworks by Stanza about Surveillance art and privacy. Artworks by Stanza that in some way deal with surveillance and privacy. Main artworks using CCTV surveillance and notion of control space. These are the Stars of CCTV. These images represent a portrait of England since the start of the CCTV imaging revolution.This image represented the start of the CCTV revolution. Since then we have seen CCTV cameras placed all over the United Kingdom for our “safety”, without any real debate about the ethic and accountability of surveillance in public domain space. 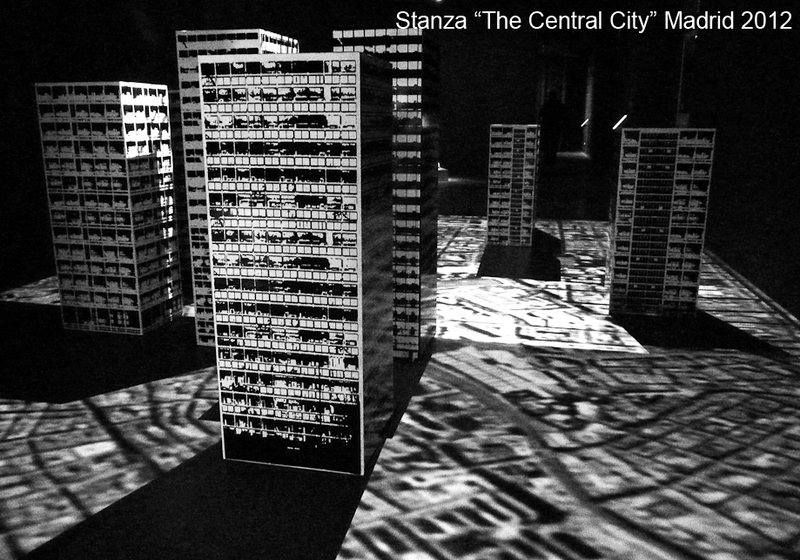 Stanza: CCTV Media Visualisation 2005. Large print On Canvas. Artworks from live media visualisations. Most of these are now large original artworks on canvas available for sale and exhibition. These images or mediascape are made from my software system that gathers images live from any webcam in the world. At your descretion it cuts them up them up to make time shift mediated artworks.